In a world of ever-rising health care costs, the need to find affordable solutions is critical. This is our goal at Health Tech Services. We strive to find devices that use technology to meet health care needs, without breaking the bank. 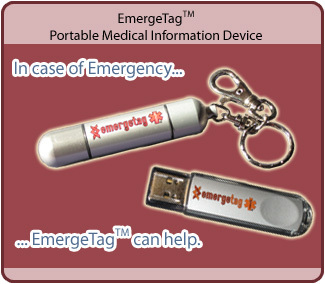 Our EmergeTag™ Portable Medical Information Device allows you to store your health and medical information in a device that is portable enough to carry with you at all times. Whether you are involved in an accident and end up in the emergency room or are simply visiting your doctor for a regular check up, you'll have all of your information at hand. For more information, visit our EmergeTag™ page, or click the EmergeTag™ image below. 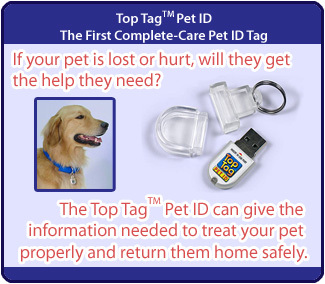 We also offer the Top Tag™ Pet ID - the first complete-care pet ID tag. This small tag contains all the vital information about your pet, which can be helpful if your pet is lost, or is staying with a pet sitter or boarder while you're away. The Top Tag™ Pet ID is in a water-proof container which can be attached to your pet's collar, cage, aquarium or whatever - so their important information is readily available at all times. For more information, visit our Top Tag™ Pet ID page, or click the Top Tag™ Pet ID image below..